Now it's time to remove the masking that has been applied in stages throughout this painting. 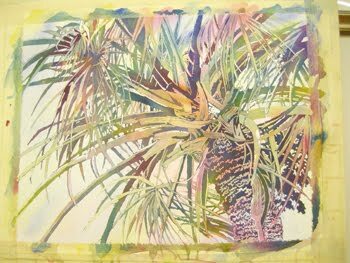 I use a tool called a Masking Fluid Pick Up. Most art supply stores should carry them. 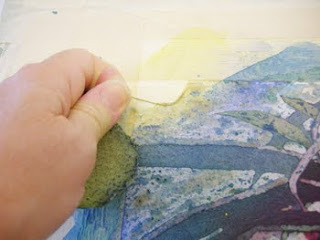 They can cleanly lift your dried masking and will keep the paper from being touched too much. Erasers tend to leave marks, so don't use them. Once you get an edge up, you can grasp it with your fingers and gently, slowly pull the masking fluid up from the paper. Take your time. If you pull too quickly you may tear the paper and all of your hard work will be ruined. Now all of the masking is removed. If you would like to soften some of the crisp edges left you can wet the paper with clean water and a soft two-inch brush. Avoid over brushing as this will lift a lot of pigment and make your painting look "washed out". At this stage you can really see the beautiful blending of the colors and you can study and decide which areas may need small repairs. You may need to lift a little here and there, and you may need to add more color to other areas. Beautiful.... OMC what lovely colors.